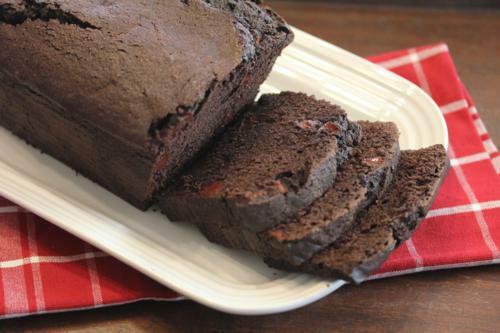 If you like chocolate this gluten free dark chocolate loaf cake is for you. It is rich and delicious and oh so very good. Next time I make this I will be freezing some of it because I ate way to much of it when I made it a few weeks ago. And the picture of this loaf cake does not do it justice. When I posted the picture on facebook several readers asked why it was blue or purple. Between the lighting and the deep dark chocolate it is hard to tell what this was like, but believe me it was really good. In a mixing bowl combine butter, sugar, salt, vanilla, baking powder, baking soda, and cocoa. Mix until combined. In a small bowl combine rice flour, potato starch, cornstarch, and xanthan gum. Add half of the flour mixture to mixing bowl. Add remaining flour mixture and stir just until combined. Pour into loaf pan and bake at 350 for 55-60 minutes. Cool in loaf pan for 5 minutes and remove from pan to cool on wire rack.